On Monday, the Academic Standards Review Commission met for the 3rd time. I was only able to stay for the first half of the meeting, but tweeted during my time there. NC DPI was brought in again, this time to explain the math. DPI brought in a team of 6 to present, however after two hours, the only presenter up there was still the first one – Dr. Jennifer Curtis. 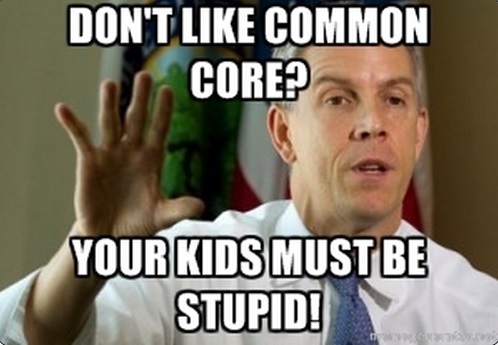 Read my storify article, NC Common Core Review Mtg – 11-17-14, and see why the initial presentation stalled out and the overall theme of parents being ‘misinformed’ and teachers ‘making bad choices’ on curriculum being the problem and not the fundamentally flawed and experimental Common Core. Nothing is wrong with the Common Core. It’s your fault you’re too dumb to get the ‘new’ math. This entry was posted in Academic Standards Review Commission, Common Core, LL1885, NC DPI, Shutuppery, Storify and tagged ASRC. Bookmark the permalink.